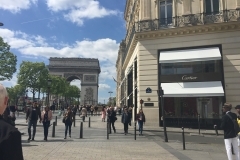 When planning my mum’s (Barbie) visit to Paris, France, what worried me the most was how we were going to get around since she has limited mobility and uses a wheelchair. Yes, there are taxis and Uber is fantastic, and drivers helped me get the wheelchair in and out of the car. But she was here for seven weeks, and pretty soon that expense would add up. Well, I shouldn’t have worried. And neither should you! 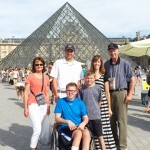 There are some great wheelchair friendly transportation options in Paris, France. This is my favorite APP for any sort of travel in France. I use the APP Citymapper for every form of public transport. It is incredibly easy and gives you loads of options. It will tell you if there is a disruption and suggest a better alternative. 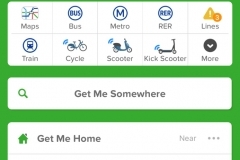 Citymapper gives you step by step instructions during your travel too. Itinerary planning can be organized best with this website. When you search for a route, click on “Access Facilities” and check the option “Find suitable trips for wheelchair users”. Window shopping became one of our favourite activities. Paris window displays are quite stunning. 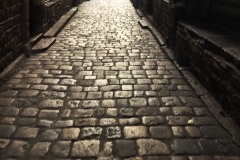 Most streets have gentle ramps. Barbie’s wheelchair has a very low ground clearance, as long as she stayed in the middle, she was fine. 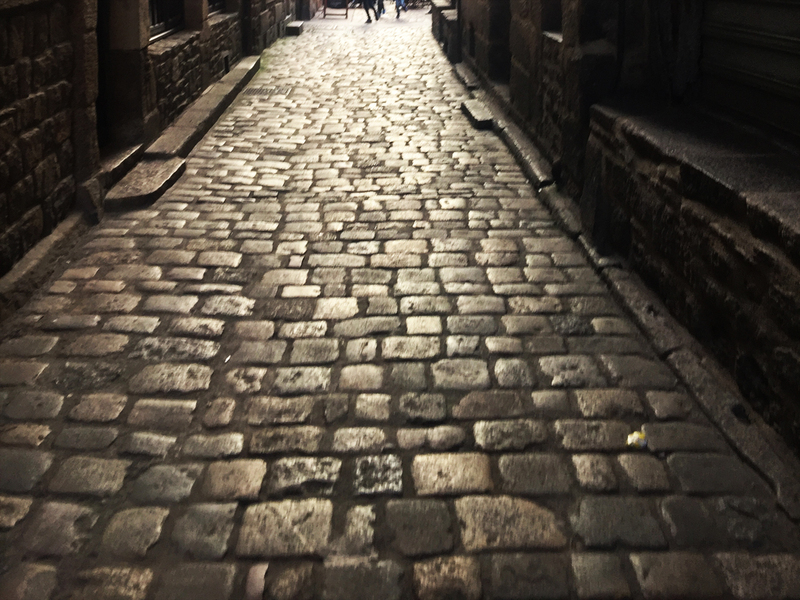 Cobblestones and Sidewalks: It may seem like every street in Paris is undergoing road works or pipe laying. And therefore, the footpaths are not well maintained. For the most part, it is fairly easy to navigate. It certainly helps if you are travelling with someone else with a second pair of eyes. There is so much activity and pretty windows to see. In Paris, not all dog owners pick up their dog’s droppings. 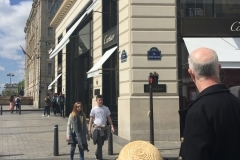 I have been stopped countless times, Parisians thanking me for collecting my dog’s poop! (a completely normal task in Australia). Navigating a wheelchair in Paris requires a keen eye for dog poop. You’ve been warned! I’d read up that there were hidden wheelchair ramps beneath each bus that slid out for accessible access. The electric ramps are located at the double doors in the middle of the bus and you simply request the ramp by pressing a clearly labelled button to the left of the doors. Barbie was a bit nervous, wondering just how easy would this process be? Let me share what happened. We waited at the bus stop and the driver noticed her wheelchair on on approach. We didn’t need to find the button to request access. (In fact, not once did we need to look, as the bus drivers can clearly see a wheelchair user on approach). 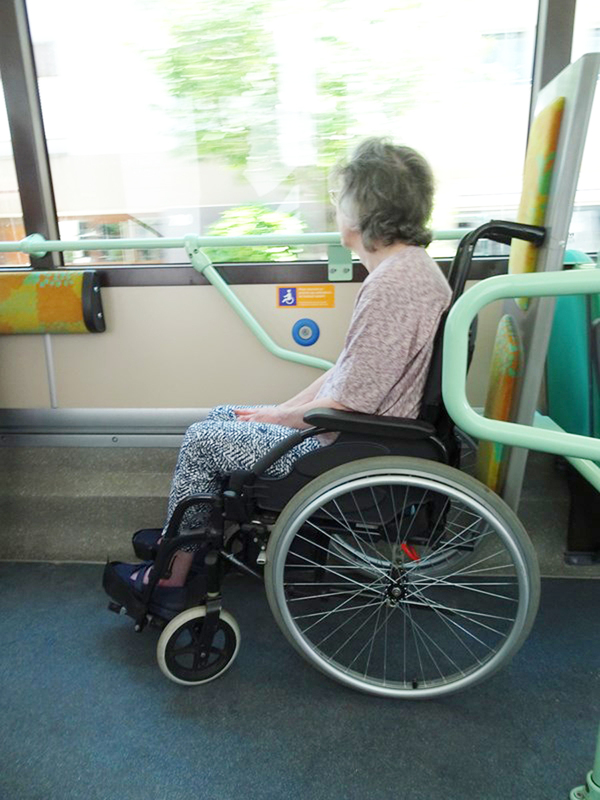 The bus stops, rear door opens, and out glides a wheelchair ramp. The entire process getting on to the bus took 15 seconds! We were giddy with excitement seeing how easy it was. The next part: getting off the bus. 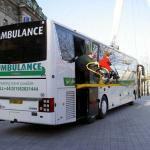 There is a designated accessible space on the bus, with sufficient room to turn around. The button to request stop is at shoulder level. Sure enough, bus stops, out slides the ramp, and voila! We are off to explore. 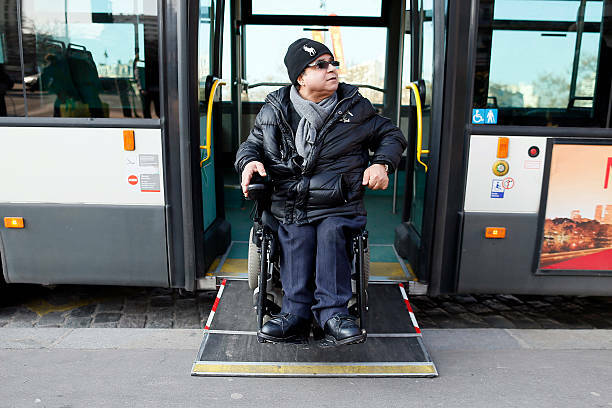 In Paris, all bus lines are declared accessible. 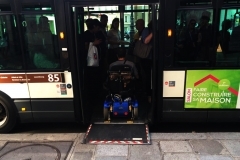 Most Paris bus stops have a raised kerb which makes the stop wheelchair accessible. 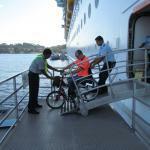 Alternatively, the ramp offers a reassuring solution. As I’ve explained, all buses have a slide out ramp that is quick and efficient for getting on and off. I recommend you avoid bus travel during peak times (8 am to 9:30 am and 4:30 to 7 pm. Paris is a busy city, and it gets squishy. Not everyone remembers their manners and keeps the designated accessible area clear. 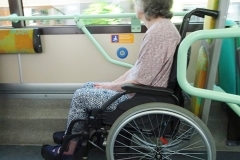 In fact, in the news recently a bus driver kicked all passengers off his bus (except this wheelchair user) because they had refused to clear space for a wheelchair traveller! They certainly learnt their lesson. I can honestly say, in the seven weeks Barbie and I travelled on buses, we experienced nothing but kindness. On one day, Barbie was daydreaming about a hot chocolate and a croissant and forgot to get her wheelchair turned around in time. Half a dozen passengers hollered for the driver to stop and get the ramp positioned. 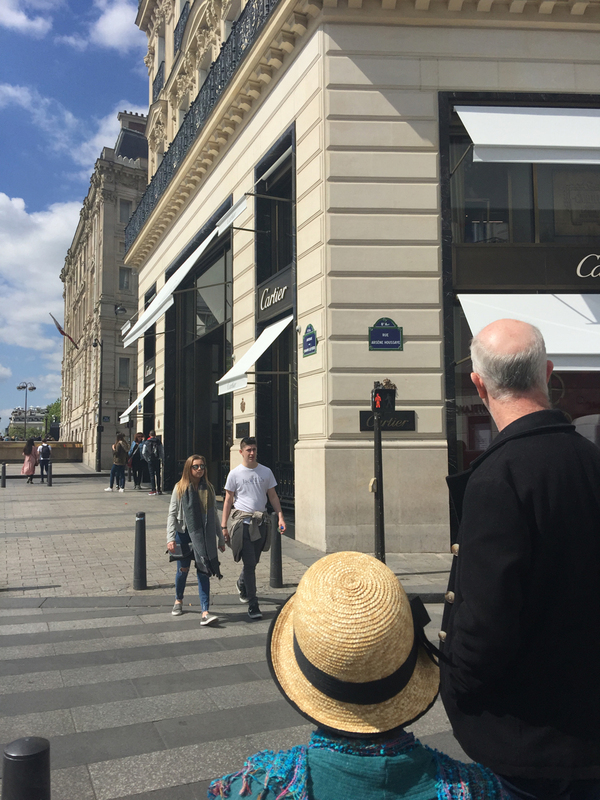 Several walked behind us just to make sure we were ok. Parisians are for the most part kind, helpful and most of all, respectful of people with disabilities. Trams are really located further out of Paris. It is handy to know that tram lines are 100% accessible, with low floor vehicles and walk-in bays. 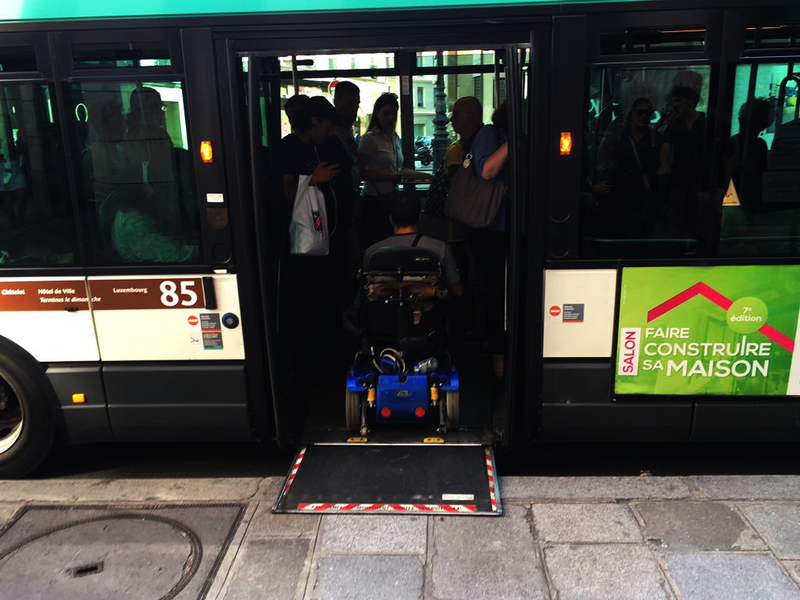 Outside Paris, the mesh of accessible bus lines becomes less useful, as it’s the rail network that offers the best alternatives of travel. As you travel further the TGV (fast trains) operate very similar to the ramp set up that I described about buses. Forget using trains in Paris itself, there are only a few wheelchair accessible stations. 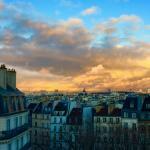 Kerry Williams is an Australian who has lived in the heart of Paris for 2 years. 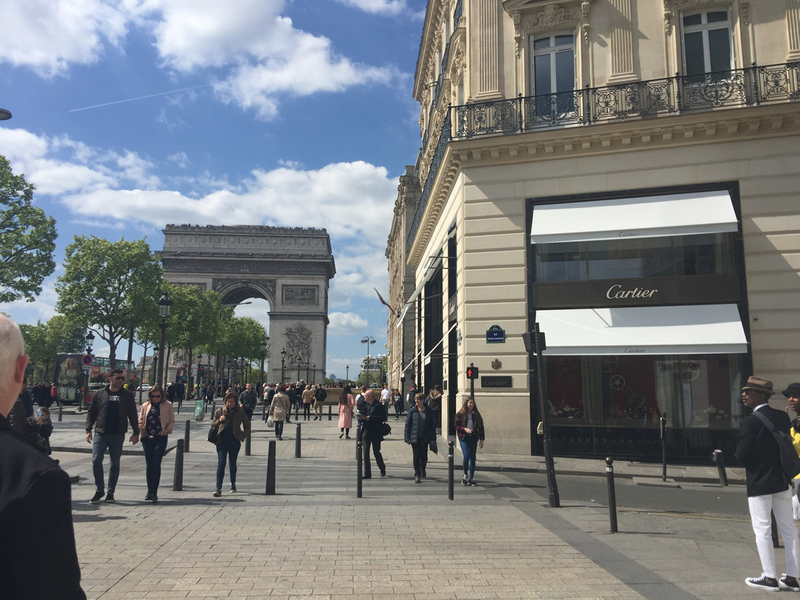 Recently, she brought her mum Barbie (a wheelchair user who has MS) over for a trip to Paris. Kerry shares with you her experiences from a wheelchair users’ perspective. 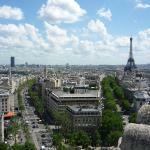 Including: accessible public transport, lesser known things to do and see, and the quirky yet entertaining River Seine.